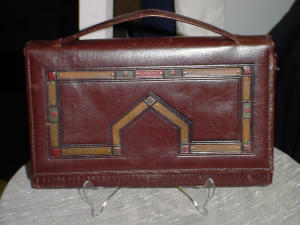 Here is a super arts & crafts circa 1930's leather purse. Its brown with a colorful geometric design in the front. Envelope type closure with a handle extending from the top. Back has a pocket slit. Inside has four compartments-two coin purses- inside each other. Small inside label reads Genuine Calf made in USA. This in such a neat find!